What do you think about the LEGO the movie castle set? Are you going to pick one up? Probably. It's not the highest priority on my list, but it is on my list. I plan to get one in a couple months. Possiably more, my main issue is I am not fond of the minifigs. However I am mostly using the set as a parts pack so its not a huge deal. I already got one and I love it both models are awesome. It comes with two castle figs which is always nice. I'm probably going to get a second one so I can have both models built. I want to get one 'cos it actually looks quite decent. Seems like a great deal with over 400 parts for $30, especially if you can find it on sale. It also seems like the figures and colors fit in with the recent Castle theme. Looks like a great parts pack, even if you don't like official models. I'll probably pick up a copy or two. It looks like a nice addition to my Castle collection. Guess I'm going to be the only one going "meh" in this thread. I don't like big pre-fab wall pieces or tower pieces. There is very little in this set I would actually want. In fact, I think maybe the only thing I'd want is the face on the female fig. There are some great pieces here, but the panels aren't too appealing to me. However, Nows not a bad time to get this if you are wanting it for a parts pack. Toys R Us has $20.00 off a $75.00 purchase. These are $29.99, so get two, throw in three Laketown polybags, and you hit $75.00. The price will drop to $55.00 and you will get free shipping for spending over $49.00. 800 + castle pieces with 4 castle knights and 2 city figures for $40.00? Yes please. Actually, I literally just talked myself into buying this deal, thanks me! I don´t find this set any intriguing, the Movie theme have good sets but this is not one. The use of panels is one of the let downs but it is understandable why TLG used them becuase the "aircraft" build or wierd vehicle build wouldn´t be stable enough to play with without them. I have now seen the film, and question myself about: Why no classic factions? 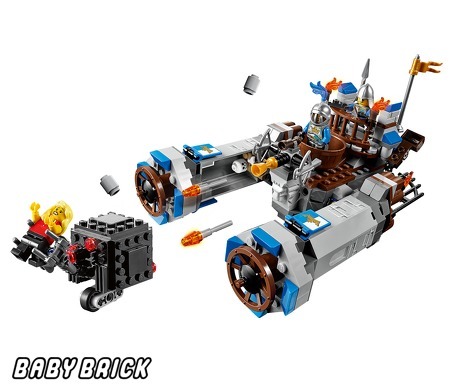 Is the Medieval theme (and the weird vehicle we see in this set) this represented in the movie to owe getting a Set? Black Falcons could have seen quite a return, even with those new shields seen in the Joust. Apart from that, it is always nice to get another castle in the line this year, but none from the film, and much original/civilian with the regular "castle" brand would have been much more appreciated. End of the year will tell. If I see it discounted and feel in the mood, maybe I will buy one (or more, depending on discount amount and purse at the time), but I see nothing special about it, except that this is one of the few castle-able sets we will have this year (nothing more than battlepacks for castle in 2014 announced AFAIK). I've got it. The castle gate version is nice but I'm not interested in transforming it into the weird spaceship thing. I don't actually remember that happening in the movie, and I don't remember the blond woman and weird grabby box thing, so I'll have to watch the movie again. The torches are weird as well. And I don't get the shakey fence with the boney arms on one of the towers.